(Nanowerk Spotlight) Due to the unique physical and chemical characteristics, such as good electrical conductivity, low weight, large surface areas, high electrochemical activity, and facile doping of heteroatoms or inorganic species, there are increasing demands of fabricating two-dimensional (2D) porous carbon for lithium-ion batteries, supercapacitors, electrochemical catalysts and many other emerged applications in energy storage and conversion. "Such 2D carbons show sub-nanometer to nanometer thickness, which is highly important for electrochemical applications, the entire carbon framework of these 2D nanomaterials is exposed to the electrolyte and all the active sites can take part in the reactions," says Dr. Chong Cheng, an AvH research fellow and expert in carbon nanomaterials at the Department of Chemistry at Freie Universität Berlin (Germany). Hence, developing 2D carbon nanomaterials with controllable pore sizes, facile heteroatoms/inorganic species doping, and low-cost shows urgent importance in current material science and global clean energy researches. "However, the currently established synthetic processes for fabricating 2D porous carbons are either quite complex or enormous time/energy consuming, and the large-scale synthesis of these materials seems nearly impossible," says Dr. Shuang Li, an electrocatalysts researcher and carbon nanomaterials specialist at Technische Universität Berlin (Germany). She further comments that "in current carbon nanomaterial science, it is indeed still a major challenge to develop industrial affordable protocols on fabricating 2D porous carbons with controllable morphology and electrochemical activities." Inspired by the recent advancements in metal-organic coordination chemistry, the group of Prof. Arne Thomas, Technical University of Berlin, for the first time, has developed a fast, scalable, and eco-friendly active-salt-templating (AST) strategy to engineer different types of 2D porous carbons. The fabrication process is assisted by solid-state mechanical grinding or ball milling techniques. This novel and promising new technology has been published in Angewandte Chemie ("Active Salt/Silica–Templated 2D Mesoporous FeCo-Nx-Carbon as Bifunctional Oxygen Electrodes for Zinc–Air Batteries") and Advanced Materials ("2D Porous Carbons prepared from Layered Organic–Inorganic Hybrids and their Use as Oxygen-Reduction Electrocatalysts"). Distinct from previous techniques used to fabricate 2D porous carbons, this novel strategy shows obvious advantages for large-scale production, especially its fast and eco-friendly material processing methods by using solid-state mechanical grinding or ball milling. In this technique, the iron salt can interact with diverse organic precursors to form a layered organic-inorganic hybrid structure after mechanical grinding or ball milling. Then, this layered structure is preserved during the carbonization process and controls the final carbon morphology to yield 2D porous carbons with a thicknesses of few nanometers. Furthermore, the in situ and confined growth of heteroatoms or nanocrystallites can be guaranteed by the strong metal-organic coordination structures, which thus provide a novel and simple strategy to synthesize diverse heteroatoms or nanocrystallites doped electrochemical active carbon materials. 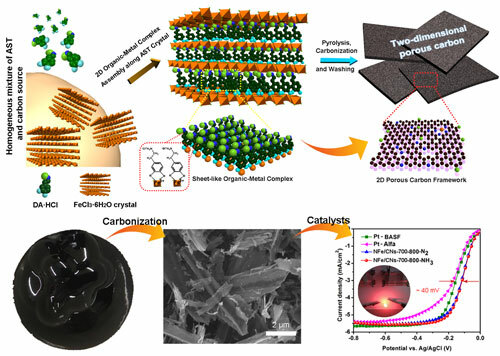 "By using this technology, we have fabricated a 2D Fe-N co-doped microporous carbon, which exhibits exceptional performance for the oxygen reduction reaction," says Shuang Li. "The activity of our catalyst can even exceed the performance of the state-of-art Pt-carbon catalyst, which endows this carbon material promising application potential in fuel cells or metal air batteries"
She also emphasizes that "to further introduce mesoporous structure into these 2D microporous carbon, we have improved this material processing method by adding different silica nanoparticles as hard templates; we can then facilely fabricate 2D hierarchical meso-/microporous carbon with confined doping of multiple heteroatoms or nanocrystallites in carbon frameworks." "Our discovery by using active-salt-templating method and solid-state mechanical grinding or ball milling techniques may create a new industrial affordable and adaptable pathway for scalable and controllable synthesis of diverse kinds of micro-/nano-structured carbon materials," the researchers note. The next steps for the group will be to use this technology to produce more rationally designed heteroatoms/nanocrystallites doped porous carbons for many other new energy storage and conversion applications, such as sodium-ion batteries, water splitting, and catalysts for CO2 and N2 reduction.